Steven (Chicagoland, United States) on 19 July 2010 in Cityscape & Urban and Portfolio. As I previosly mentioned, I was not impressed with Roosevelt Island. The condition of the park was just not up to par with the other presidential monuments. Perhaps because this island seemed to be remotely located and there aren't many visitors to the island? The only visitors we came in contact with were the area residents who were there using the paths and boardwalks as places to jog and exercise. 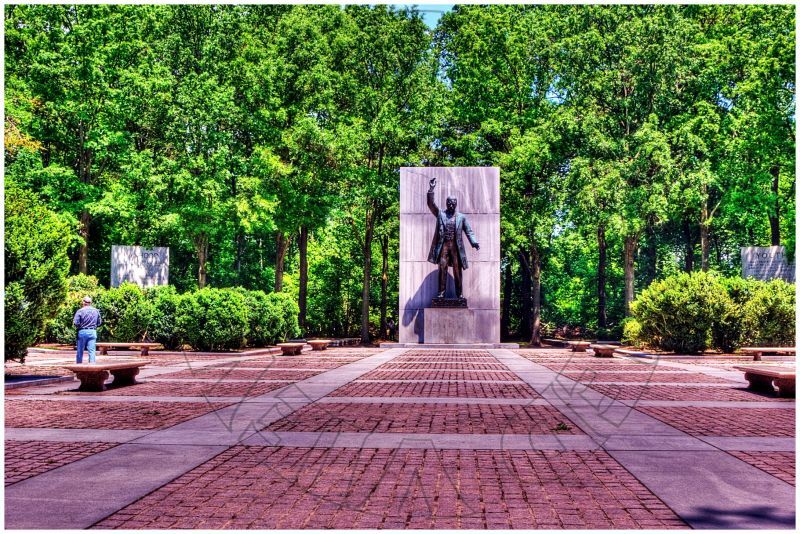 The big reveal was when we arrived at the center of the island and from out of the wooded area we came upon the plaza that contained reflecting pools, two large fountains, four large stone monoliths and a statue of Roosevelt himself, as pictured here. This was my first view as we came into the clearing. What was disheartening was that the fountains were not in operation and were bone dry; as were the reflecting pools. It looked like a deserted island. Photo captured on May 6, 2010. Beautiful colours and details.. excellent shot. I love the low angle which adds a lot of additional interest to the shot. Wow that IS disheartening Steven. And what potential this would seem to have....nevertheless your capture is great. Sorry about the letdown. I think Teddy deserves better! I like your photo of him sort of nestled in the nature he enjoyed. There seems to be a ranking of popularity among your presidents. Maybe it's the design of this one, too: it looks like he's talking to a missing audience.